Paris, France—Among the multiple paradoxes that characterize the presidential spectacle here in France, there is one in particular that deserves attention: the difficulties of many leading candidacies to decide whether they have been successful or whether they have experienced defeat. On the evening of April 23 [the first round of voting] when it became clear that Left candidate Jean-Luc Mélenchon would not be in the runoff, rather than emphasize the enormous success that the 7,000,000 votes for him signified, he did not hide the fact that he considered it a major defeat. A similar example on the other side: On May 7, Marine Le Pen surpassed the threshold of 10,000,000 votes in the runoff, and yet, she is “beaten.” A “defeat,” then, that it seems will have very important consequences for her and for the [neo-fascist] National Front. It even reaches centrist Emmanuel Macron, the big-time winner and now President of France, about whom certain interpretations tend to throw doubt on the nature of his victory, which resulted perhaps from incredible luck, that is to say, an historical accident. We can interpret this surprising motif as having the quality of a symptom, the expression of a complex reality that brings together intersecting factors, perhaps by chance, and structural evolutions that were a long time coming. The dizzying character of the unfolding of electoral events manifested itself as a succession of “surprises” that have permanently turned the framework of the election upside-down, and brought down any pre-conceived scenarios. Let us remember the renunciation of President François Hollande, which provoked the scrapping of the element that gives structure to a presidential election: the evaluation of the outgoing president and the offer of an alternative. For Les Républicains/LR and the Parti Socialiste/PS, primary elections were bundles of surprises: the elimination of former Prime Minister Alain Juppé and former President Nicolas Sarkozy in favor of former Prime Minister François Fillon and the elimination of former Prime Minister Manuel Valls, to the benefit of Socialist Party candidate Benoît Hamon. LR was dragged down by the mishap of Fillon, an enigmatic character who, having totally lost credibility, was able to maintain the strength of his candidacy. While the candidates coming out of the primaries saw themselves diminished in value, those who imposed themselves from outside of that primary process, thus projecting an entirely different logic, grew in power: Le Pen, Macron, and Mélenchon. That in a few months, without the support of a major established political party, this very young man should get himself elected President of the Republic, is indeed extraordinary. That Macron overcame the two competitors who touted themes similar to his own—political renewal, the transcendence of the Left/Right divide, the movement against the old parties—is not only by the good graces of his youth and competency. It’s also for a more critical reason. He was the one who was in position to fill the space left open by the successive elimination of those who are “naturally” presidential (those who deserve the label “statesman”): Hollande, Juppé, Sarkozy, Fillon, even Valls. In that topsy-turvy context, the ruling class decided that Macron was the man for the job. From then on, barring any contingencies or surprises, he should win. Naïve indeed, he who imagines that those in power will entrust to the political lottery and to the whimsical citizens the choice of who will lead, not just this or that party or local collectivity, but The State! “Men are one thing, structures are another. And power structures use men far more than they will admit to themselves. The astonishing success of the new president owes not so much to his own brilliance or the aspirations for social change of French voters, as to the wishes of those who saw in him their best tool, those generous donors from the financial sector or the corporations, those high government officials who meticulously paved the way for him. Might Emmanuel Macron envision a French ‘spoils system’? Yet, for the very first time, it would not be necessary—the men in place at Bercy [the Finance Ministry], at the Treasury, and even in most of the cabinet ministries have already been bought out” (Le Figaro, May 13, 2017). It remains that if Macron was the providential man of the hour, it is only individually, and it is in no one’s interest to forget that he is not without talent. Not least was perceiving the changes in society, and having the audacity to bet on them: hope for a change of political leadership, the chance to break up the central political space by shaking up the traditional parties that were in great difficulty, and doing this by using the National Front as a lever. When the ruling class understands that everything has to change so that nothing changes, this indicates that it is effectively time for great mutations. The challenge is to grasp what they are. 1. What is the strategic significance of Macron’s election? If Macron’s success is incontestable, his potential to change the political field is not yet clear. Yet it is great. To underestimate it would be to repeat the error which once led to the belief that his rise to power was only a momentary bubble ready to burst. His strategic wager is to build a central bloc (“both of the Left and the Right”). It is already won with the presidency, reinforced by the nomination of Edouard Phillippe [as Prime Minister]. It means that two facts are likely to form the structure of the future: 1. The marginalization of the Left (the “radical” Left as much as the social democratic Left); and 2. The establishment of the National Front as the “Opposition” to the presidential majority. The impotence of different components of the Left who have not rallied behind the Macron project to respond to that future seems evident. And equally the impotence of the Right, to avoid its own division, confronted as it is by an enterprise that has it by the throat. 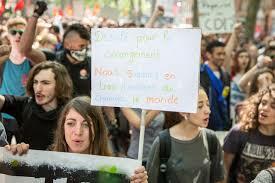 Contrary to what certain commentaries say, it is not a question of simple “poaching” or “spoils of war” (the Sarkozist model of 2007), but a political demonstration: with Macron, the Right (or a part of it) could govern—and in doing so remain the Right (unlike Macron, formerly of the Left). Those two themes combine with a third element, “objective complicity” with the National Front to pose a new dividing line between globalists/patriots, instead of the opposition of progressives/conservatives. The logic is to present the Macron synthesis as a viable response to the anti-European, nationalist and racist populism of the National Front. This requires legitimizing neoliberalism as the only possible future in terms of the economy, the society, and the relation of liberalism to freedom and rights. Who would not see that such a divide would be destructive to the class-conscious Left? 2. What future for the National Front? • The historic double score obtained in the first round (7,680,000 votes) and the second round (10,450,000). • The National Front is positioned as the opposition to Macron, which puts it in confrontation with the new presidential majority, and allows it to present its own parameters (for example, regarding the European Union and the Euro) as the “alternative” in the coming years. Is it not a problem that “system change” is put forward as possible through an electoral victory (and a presidential one at that)? By the electoral route, one can try to prevent the adversary from acting, or to create conditions for important reforms, that is, to create an opening in the use of political power, but beyond that? What is a “citizens’ revolution”? The “big sweep” makes sense from the National Front side. A large part of the voters for Marine Le Pen seem to know the meaning of their vote: “Turn the tables!” That is to say, to trigger a political upset, assuming that one doesn’t know where it will lead. But the Left? As for Macron, he has achieved a spectacular triumph: to present himself as “outside the system,” he, the purest product of that system! • “The Left,” yes or no? When a party of those who call themselves and perceive themselves as being of “The Left” meets a new and “modern” Right, can it claim to be of the “Left”? 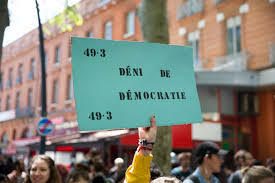 It is necessary to take into account that the vast majority of the vote for Mélenchon was a vote of the Left (of ordinary people, young, strong in the traditional leftist sectors), but in favor of a project not in the framework of the radical Left, nor even of the Left in general. • If we retain the framework of the Left, do we recognize that it is necessarily pluralist, and with what consequences? • The days of parties, in the diversity of their realities, is it past? If so, in favor of what kind of organization or movement? • Between a restored Fifth Republic and a hazy Sixth one, what possibilities for democracy? We can hardly ignore that these questions are already being asked (but very confusedly) at the time of the legislative elections. Macron symbolizes an acceleration of history; he is the bearer of a strategic plan of destabilization and of remolding the political field, as well as an unprecedented ideological synthesis aspiring to respond to contemporary challenges. If the class-conscious Left wishes to survive, it will have to tear itself away from certain destructive burdens, to lift itself to the level of such a challenge, which calls for a political and cultural rearmament of great magnitude. This entry was posted in Articles and tagged Alain Juppé, Benoît Hamon, D. Cheneville, Emmanuel Macron, France, Francis Sitel, François Fillon, French National Front, French Socialist Party, Jean-Luc Melenchon, Le Figaro, Les Républicains, Manuel Valls, Natasha Polony, Nicolas Dupont-Aignan, Nicolas Sarkozy. Bookmark the permalink. It´s somewhat strange to find an article like this in N & L. Elections in France are an important subject, and maybe more important if it’s a French who writes about it. However, the essay is merely a political analysis, quite abstract, for the French masses –the subjects of revolution who can actually “turn the tables” in that country– appear nowhere, except marginally as objects moved by the waves of political parties. If the actions and thoughts of the subjects of revolution are not an integral part of the analysis of the situation, then there is no possible way out of it: The solution of the problem is not posed in the problem itself, and therefore it has to come externally –in the form, for example, of the “radical Left” parties substituting for the masses as subjects of social change. A concrete humanist view of what is happening in France is needed. I guess this is why the essay is entitled as “discussion article”.